If you want to achieve peak performance in your chosen sport, you must follow a good sports nutrition guide to direct your eating habits. Becoming a good athlete require that you inherit good genes from your parents, it also require that you have a good training program, and that you stick to a good sports nutrition diet. You need to consume carbohydrates if you want to have the energy for training and performance. Only a limited supply of carbohydrates can be stored at any one time. And so carbohydrate intake is a necessary daily requirement to fuel the training program. Daily intake need to take into consideration the athlete’s size and training regime and calculations should be based on the athlete’s daily needs in grams per kilo of body weight. So an athlete, who exercises moderately, will need an intake of 5-7 grams of carbohydrates per kilo of body weight, while an athlete who trains heavily will need to fuel up with 7-10 grams per kilo of body weight. Water is an essential nutrient for an athlete and every sports nutrition guide would confirm this. 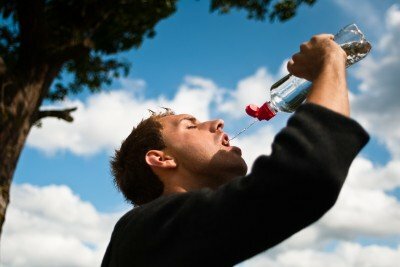 Before exercise begins the athlete should already be fully hydrated. Any loss of fluids above 1% of body weight can be detrimental to performance. Exercise produces heat and as a means of trying to cool itself down the body sweats and water is loss through evaporation and must be replaced. You should try to stay hydrated or at least be able to quickly replace fluids as it is lost during training. Although the excessive consumption of dietary fats should be discouraged, we shouldn’t be overly concerned by this and try to avoid fats altogether. It is necessary that some fats are included in our diets. For the typical moderate exercise, almost half the total energy consumption comes from fatty acid metabolism. The amount of dietary fat that is needed depend on a number of factors such as body size and training levels. But as a sports nutrition guide will tell you, you cannot do without fats in your diet. Your body needs protein to repair damage tissue and build muscles. Studies have suggested that an athlete in heavy training will need 1.2-1.7 grams of protein per kilo of body weight daily. This is in contrast with the recommended daily intake for sedentary people of 0.8 gram. There is no clear evidence that athletes have a higher need for protein than other people. Although the debate about the protein needs of athlete is largely unnecessary as most people consume more than the highest recommended intake. A good sports nutrition guide would tell you that vitamins and minerals are also important for athletes. These vitamins and minerals are best obtain from a varied diet, based on nutrient rich foods such as vegetables, beans, fish and dairy produce. Surveys show that most athletes are able to meet their daily recommended requirements through eating normal everyday foods. There are no studies to show that increased vitamin or mineral intake enhance the performance of athletes, although a deficiency in these nutrients can hinder your performance. Athletes who are at risk are ones who restrict their energy intake to meet weight loss goals and those who have a narrow choice of foods they like or can eat. So, for these a course of supplementation might be required. The pre-competition meal should be taken about 3-4 hours before the event. It is best to keep it light and it should be a carbohydrate rich meal. This will increase your glycogen stores and therefore enhance your performance. This is especially true when your event is of sufficient duration and intensity to challenge your carbohydrate stores. On these occasions it is recommended that the athlete consume 1-4 grams of carbohydrates per kilo of body weight. For shorter events the pre-competition meal does not have to be dominated by carbohydrates. You should also ensure that an adequate amount of fluids is taken on board in preparation for the competition. Recovery from training and or competition is an important feature of the athlete’s over all preparation strategy. This strategy should include replenishing your carbohydrate stores. The timing of the carbohydrate intake is also very important. This is because the highest glycogen storage happens in the first few hours after exercise. This can be achieved with a few small snacks taken regularly, oppose to one large meal. Types of foods to have on hand are fruits such as apples, oranges and bananas, sport drinks and fruit juices, whole wheat bread, cakes, yoghurt and the like. What exactly makes a good diet according to a sports nutrition guide? Here are some tips to help you design a good diet for athletes. If you are looking for some great new recipes, you will love the ones given here that combine health and taste. All the fitness and athlete magazines are full of advertisements of sports nutrition supplements. But do these things actually work? Physically active kids have an increased need for good nutrition. Discover the factors affecting young people's nutritional needs. Vegetarians need the same nutrients as other sports people, they just have to get it from non-meat sources. Find out what these are in this article! It is not always easy to choose the right sports nutrition courses. This article helps you to cut through the fluff and get to the heart of the matter. Knowledge of sports nutrition is important to all sports, none more so than endurance events. Read and learn the what and the when of endurance sports nutrition. From "Sports Nutrition Guide" Back To " Faster, Stronger, Better – Your Shortcut To Improved Athletic Performance"